Hackers are becoming more sophisticated, requiring organizations to reanalyze and revamp their current security protocols to adequately protect their customers’ payment and personal data. According to a new white paper from Boston Retail Partners (BRP), there is no single strategy that can entirely eliminate the risk of a data breach. While EMV has received most of the attention lately, there are other security strategies that play a much greater role in protecting sensitive payment card and personal information. 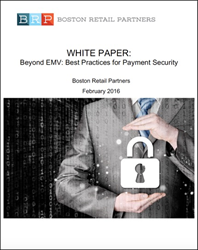 The Beyond EMV: Best Practices for Payment Security white paper provides retailers practical tips on how to improve the security of their customers’ payment card and personal data. Boston Retail Partners’ 2016 POS/Customer Engagement Survey recently found that 49% of retailers have implemented end-to-end encryption (E2EE) and 35% have implemented tokenization of payment data at rest. Unfortunately, even as retailers focus their efforts on EMV and increasing data security in-store, fraudsters have recognized gaps in online security and are shifting their efforts to the exploitation of e-commerce sites. Online transactions create a unique set of security challenges. To protect against fraudulent online transactions, retailers must implement a rules-based fraud detection tool, auditing suspect transactions and authorizing legitimate ones.